Note: For an opportunity to vividly imagine Civil War events at the Fredericksburg Baptist Church, mentioned below—and at other local places of worship as well—I invite you to attend The Churches Remember, a multi-component, free event this Saturday commemorating the Civil War Sesquicentennial. Note that dramatic readings will occur in the Baptist Church at 7:00 p.m., and that historian George Rable, who has written in-depth about wartime destruction in the Fredericksburg area—the general subject of my post here—with speak earlier in the day: 10:45 at St. George’s Church. 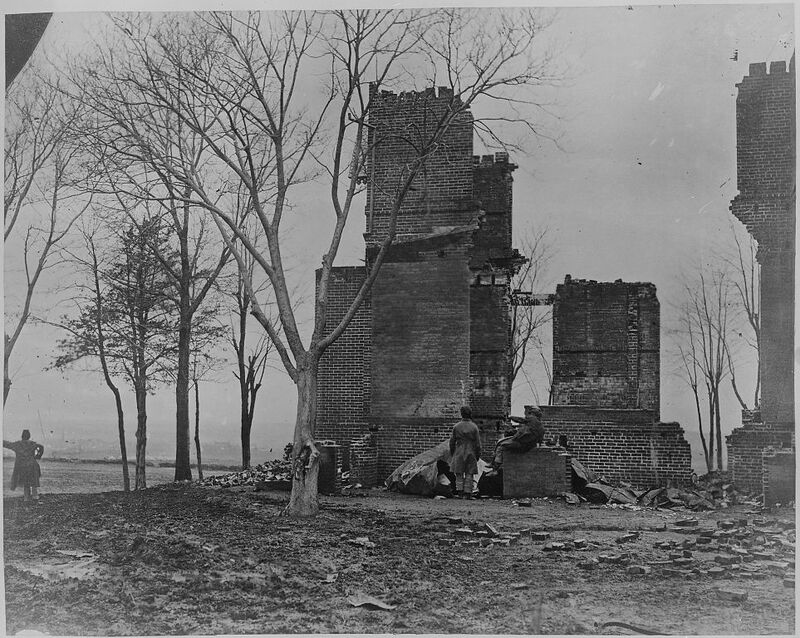 Given that the towering gables and second story of the brick shell visible in the smoking-ruins image had vanished by the time of the photograph I post at the top, I assumed that a considerable period had elapsed between the taking of the two images. So when was the scene at top photographed? Last week brought spring winds to the park. 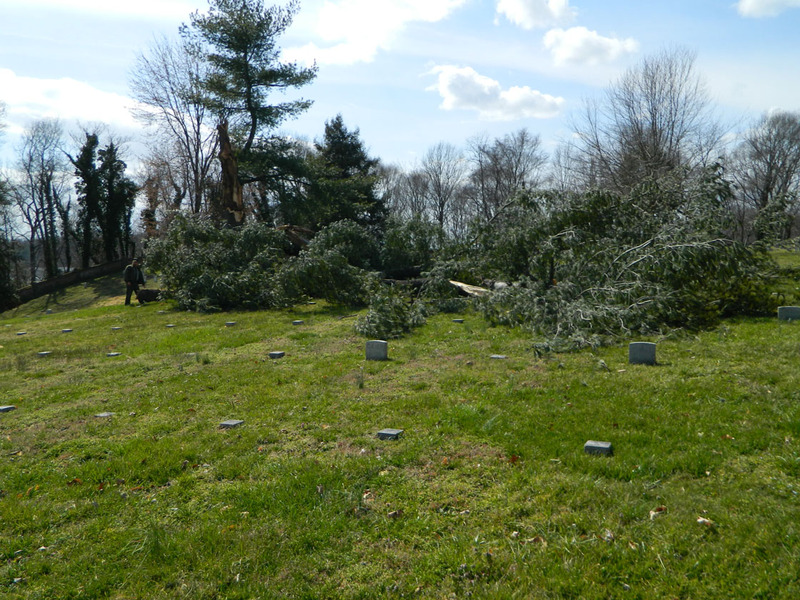 Among the casualties was a tree in the National Cemetery. I am always struck by how much effort we–an organization fundamentally committed to preserving nature’s work–spend battling Mother Nature’s efforts to either overgrow or destroy. Most of our budget is spent on keeping nature in its place. Sometimes nature wins. 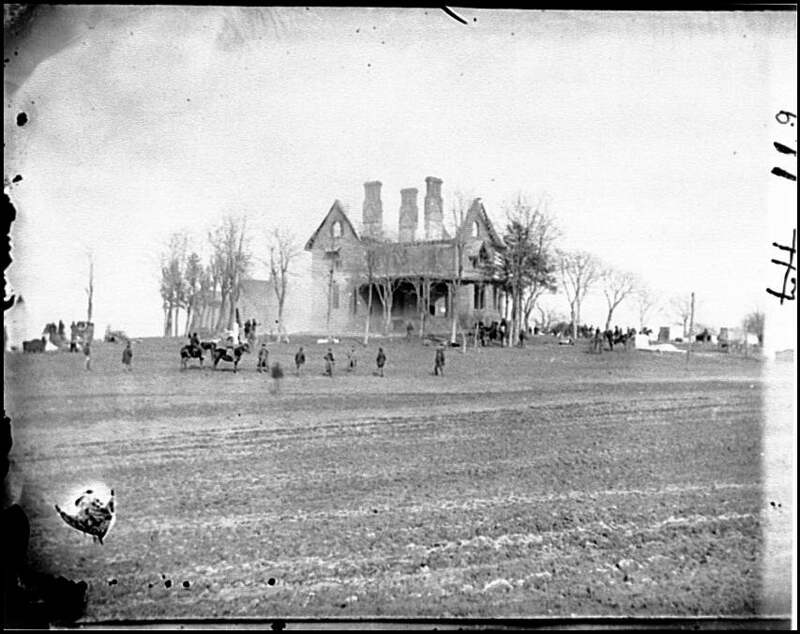 Although the engagement at the John Alrich farm, on May 15, 1864, was the first combat action involving United States Colored Troops (USCT’s) in Spotsylvania County, it was not the only such combat in the county. A second engagement, now almost unknown aside from a brief mention in Noah Andre Trudeau’s Like Men of War: Black Troops in the Civil War, featured them again, four days later. What follows describes historical detective work undertaken in 2012 to discover the location of their May 19th skirmish. On May 17, 1864, the six USCT regiments (and a detachment from the 29th Connecticut Infantry) composing the two infantry brigades of Brig. Gen. Edward S. Ferrero’s division moved east from bivouacs in the vicinity of the Alrich and Isaac Silver farms, both on the Orange Plank Road, to the area of Salem Church. Salem Church, principal landmark for the main camp of the USCT regiments on May 17-22, 1864, the period of their second combat in Spotsylvania County. National Park Service photo. Grouped under the great pine trees, the scene lighted up by fires of pine knots, the men, all wearing their accouterments, gathered. Every black face was sober and reverent. The leader “lined off” the words of the hymn, and all sang…. Then came prayers and exhortations. An encounter with the enemy was indeed in the immediate offing for the USCT’s.